This timeline shows the sales figures for sporting goods of U.S. electronic shopping and mail-order houses since 2003. In 2017, the value of sporting goods e-commerce sales was 16.9 billion U.S. dollars, up from 14.5 billion U.S. dollars in 2016. As of 2015, the United States is still the largest single-country retail market in the world, although economical analysts predict China will take the lead by 2018. Asia and Australasia is already the leading region of the global retail market, with forecasted sales in 2016 amounting to some 12 trillion U.S. dollars, almost three times more than predicted sales in North America. As of 2013, the total value of retail trade sales in the United States amounts up to 4.64 trillion U.S. dollars, a sizeable growth from the 3.26 trillion figure reported a decade earlier. A considerable share of the total sales for 2014, representing more than 63 billion U.S. dollars, was spent on sporting goods, which marks a 10 billion U.S. dollar increase in spending from 2008. Some 44 billion U.S. dollars were generated by sporting goods store sales, an almost threefold increase from the figures of three decades prior, while the 18 billion difference is shared between many other distribution channels, such as specialty sports shops, pro shops or discount stores. 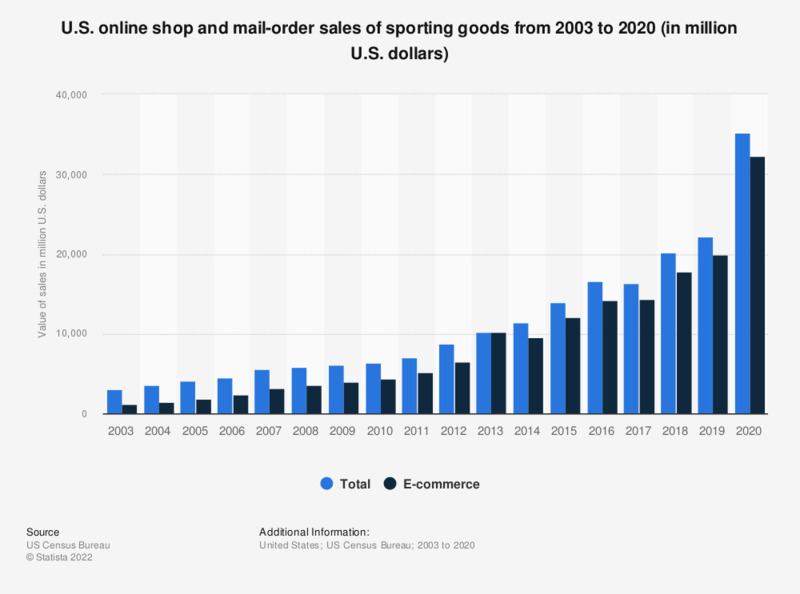 However, the second most popular way of buying sporting goods in the Unites States is through online shops and mail-orders, with sales on these platforms amounting to almost 10 billion U.S. dollars in 2014. In a recent ranking of the leading sporting goods, footwear and apparel retailers in the United States in 2015, Walmart placed first, due to revenues that amounted to 9.6 billion U.S. dollars. The United States is also home to Nike, the most profitable sportswear and sporting goods company in the world, with 36.4 billion U.S. dollars in revenue in its 2017 fiscal year.